While making a comment in a Sunday School Gospel Doctrine class, a father related how he quells boredom among his children during long family road trips. Often, he said, they would ask, “Are we almost there yet?” or “How much longer till we get there?” This after only about 30 minutes into a journey anticipated to take several hours. Then, he hit on an idea for a practice he has used with success since then. Prior to beginning the journey, he obtains a map and marks the route of travel with the starting point, destination, and landmarks in between clearly marked. He then places it in a sheet protector to preserve it. 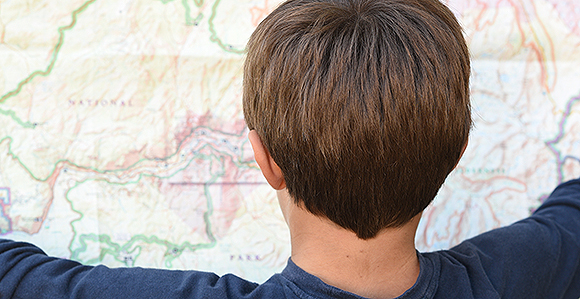 Now, when the children want to know how much longer the journey will be he hands them the map he has prepared in advance so they can see how far they have come and how much farther they need to go. It has done wonders, he says, for mitigating the restlessness of the passengers. The father shared this account by way of illustrating the value of understanding the plan of salvation or, as it is referred to in scripture, the plan of happiness, and the part our mortal probation plays in that plan. To read the rest of the article on LDS.org, click here.